India-Sri Lanka relations have moved ahead from “being focussed on the past” after President Maithripala Sirisena took over from his predecessor Mahinda Rajapaksa in January 2015, the Indian envoy said. Indian High Commissioner YK Sinha said bilateral ties have become robust and entered a new phase with highest-level engagements. Recalling a flurry of high-level visits between the two South Asian neighbours across the Palk Strait, Mr Sinha said ties entered a new phase since Mr Sirisena took over from Mr Rajapaksa. He said relations have moved ahead from being focused on the past. 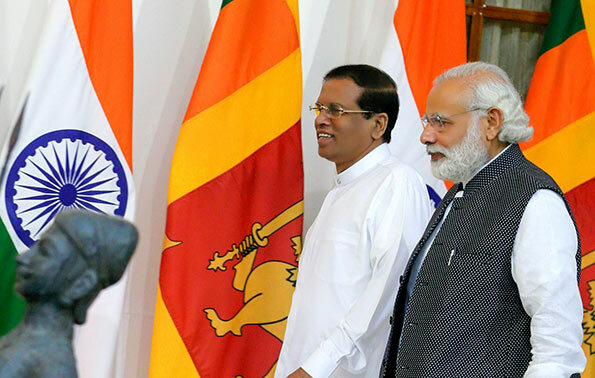 After Mr Sirisena’s ascent to power, there have been several high-level visits between India and Sri Lanka starting with Prime Minister Narendra Modi in March 2015, which marked the first visit to the island nation by an Indian leader since 1987. Mr Sirisena has twice visited India since January 2015. Prime Minister Ranil Wickremesinghe also made his first overseas visit to India, Mr Sinha said. Delivering a lecture on ‘India-Sri Lanka relations in the 21st Century’ at the Bandarnaike Centre for International Studies, Mr Sinha said bilateral trade between the two nations have formed the cornerstone in the growing relationship. Contrary to perceptions, the Free Trade Agreement (FTA) between the two countries have been most fruitful, he said. Sri Lankan exports have grown 13 times since the FTA was signed in 1999. This will show who has benefited most, the Indian ambassador said. Sri Lanka and India enjoys a robust partnership and New Delhi is Colombo’s largest partner in defence training, he said. On the fishermen issue, Mr Sinha said it was a humanitarian issue with implications on the livelihoods of those involved. Negotiations are continuing to try and resolve the issue of fishermen of the two countries crossing the International Maritime Boundary Line (IMBL), he said. He said Sri Lanka’s security is in India’s interest. India stresses the need for reconciliation in Sri Lanka through a negotiated political settlement where all communities can agree. This must be within the framework of a united Sri Lanka, Mr Sinha said. Mr Sirisena has taken steps to reconcile with the Tamil minority. Several confidence-building-measures such as the release of Tamils-owned lands, lifting of travel restrictions to the North and de-escalating the military presence have been taken since January as part of efforts to ensure reconciliation after three decades of civil war with the LTTE that claimed more than 100,000 lives, NDTV reports. Not only with India but with entire world countries have strengthened ties with us than before it is because we have a gentleman as a president.